Don’t get me wrong, we probably have a smaller collection than a lot of you who are reading this, and a larger collection than others. I’m saying I think we are pretty middling here, in a good way?! One of the storage solutions within this cabin is a display shelf for all of their little minifigures. And because one likes to think of clever ways to make things that have been done a hundred times (or is that just me?! ), this little display features detachable shelves. The instructions for this build are quite simple. Here’s a handy video showing the entire thing. There are a few more details below if you want to know more. Here’s all you need to make the minifigure display shelf. There’s not much in terms of supplies, but I’ll point out for the nice government regulatory people that this blog uses affiliate links, and that if you want to learn more you can read all about it in my disclosure section, right here. Cut a piece of 1/2″ plywood 12″ wide and 24 3/4″ long. Cut a series of 1/4″ wide dados every 2 1/4″ by setting your table saw or router to 2 1/2″. Your blade depth should be 1/4″, or just a hair over. I like the table saw for this because it’s simple to set the fence at 2 1/2″, then 5″, then 7 1/2″, and so on. Buy or cut down 9 scrap pieces of wood at 12″ long, 1 1/2″ wide, and 1/4″ thick. I had some scrap yellow heart and purple heart on hand, but it doesn’t really matter what kind of wood you use. Test the fit to be sure it is snug, but not so tight that little hands cannot get them in and out of the grooves. Cut pieces of the tape the same length as the shelves (12″), and then peel and stick to the shelf piece, lining it up to one of the long sides. There will be 1/4″ exposed on the other side to fit into the shelf grooves. That’s all there is to it. Hang it wherever you like and spend the next hour digging up all of the miniature hands, heads, hats, and minifigure miscellany that has been lost in all of your kids’ Lego bins. Just me? Ya, I didn’t think so. See, hopefully this clever little display you just built helps with this issue. Seriously, every last one of my daughter’s minifigures looks like she pulled a Brittany Spears and shaved her head. So far, my kids are digging the dedicated minifigure space. I mean, we still have a jar of random Lego body parts, but the improvement is kind of huge. Overall, I would say this Lego cabin is pretty freaking cool, and they seem to agree. 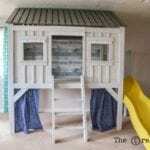 If you want more details about the playroom, you can find them here. Instructions for the elevated reading nook are here. Rope bridge details are here. Good luck, fellow Lego masters, and happy building! This is such a cute and simple idea. My girls are obsessed with Legos and they are slowly taking over our entire house! ARG!! I’ve been looking for ways to organize them and I really like this idea. Thank you! They do that! Good luck with the organization!